CBMultiLink is a script for ClickBank vendors that allows them to offer a choice of landinage pages to their affiliates. ClickBank offers a wonderful system that allows vendors to easily sell their own downloadable products such as eBooks or software. ClickBank system in fact allows a vendor to sell hundreds of different products through a single vendor account, and even helps them promote their products by offering a built-in affiliate system (paying other sites, "affiliates") commission in return for them helping the vendor increase traffic and sales. However, there are some limitations in ClickBank's technology, the most important and frustrating one for vendors being that they can only a single landing page to all their affiliates. This is not really too much of an issue for a vendor selling a single product to a single type of customer, but in other cases can be quite annoying. Imagine, for example, a vendor who wishes to offer multiple products - ideally that vendor would like to offer his affiliatea the opportunity to link directly to each individual product and still earn commissions. Another situation where a vendor might wish to offer affiliates a choice of landing pages, is if the vendor wants to sell the same product to different audiences or customer types. In this, a vendor might want to develop two or more versions of their sales-letter, and allow affiliates to link to whichever one best fits their traffic. Unfortunately, as already mentioned, ClickBank's system does not support these requirements. Some vendors got around this limitation by opening multiple accounts, one per product or per landing page. Of course that has disadvantages in itself: more manageable/administration hassle, potentially slower pay-outs (because it can take longer to reach customer distribution requirements or pay-out requirements), and higher fees, not least a $49.95 activation fee per vendor account. Additionally, using multiple accounts disperses the vendor's affiliate sales over several listings, making it hard to reach a decent "gravity" and attract ClickBank affiliates (rightly or wrongly, gravity is one of the main things that affiliates look at when deciding which ClickBank products to promote). 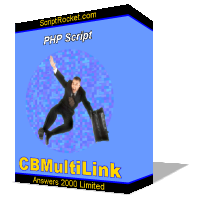 CBMultiLink is a PHP script which offers a simple solution to this issue. It allows any ClickBank vendor to offer their affiliates a choice of landing pages (as many as the vendor wants), using the vendor's existing ClickBank account. It is fully compatible with ClickBank's hoplink and tracking system - affiliates even use hoplinks (which gives affiliates confidence) when making links. And, since all affiliate sales go through the vendor's existing ClickBank account, it not only saves on fees and hassles, but makes reaching a high gravity a lot easier than would be the case if using multiple ClickBank accounts. Our company, Answers 2000 Limited, is the vendor of this CBMultiLink, and we sell this product exclusively through ClickBank. You can purchase CBMultiLink using most major credit and debit cards, or by using PayPal. Although some payment options may not be available for all customers. Disclosure: Our company is the developer and vendor of CBMultiLink.